From major subdivisions & large projects to small garage sites and driveways, we can handle them all. 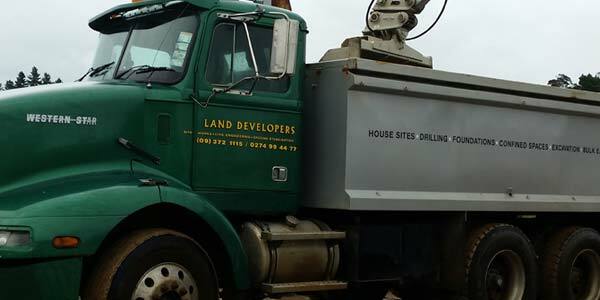 Land Developers Ltd, a Waiheke Island-based company with more than 30 years of experience working in our unique environment. A company with the people, the track record and the equipment to tackle challenging new work – wherever it might be. More than most professions, earth moving has the potential for unsightly disturbance. More than most, machinery need to be operated with caution. Proper planning and design needs to be followed. We pride ourselves on getting the job done on time and within budget. We offer an entire land development package, a one stop shop – from the initial section clearing, through to the house site & drive excavations, retaining walls, foundation footings, drilling, the supply of all metals to the concreting of the drive and final topsoiling and landscaping. This is the partnership we propose with you, to get your land developing done right. The project starts with your idea. We take great care and attention to listen and consult with our clients needs. Give us your architect’s plans. We’re entirely comfortable with that. We’ll quantify what volumes are involved with your earthworks, footings and foundations, sizes of retaining walls, square metres in metal and concrete drives. We will provide an in depth itemised quotation based on your plans supplied to us. We’ll take the hassle out of your project by organising all the inspections required by Geotech engineers, structural engineers and Council inspections.